Geology in Motion: Why Bobby Jindal was wrong when he suggested abolishing the U.S. Geological Survey: Pavlov and Cleveland volcanoes in action again! Why Bobby Jindal was wrong when he suggested abolishing the U.S. Geological Survey: Pavlov and Cleveland volcanoes in action again! It was 2009, and President Obama had just given a presidential address. In a widely televised response to the address, Governor Bobby Jindal of Louisiana mocked the volcanic monitoring program of the U.S. Geological Survey as "wasteful spending," and proposed its elimination. Much to the relief of volcanologists and the people in the Pacific Northwest, Alaska, and Hawaii who live near the volcanoes in the U.S., the eruption of Eyjafjallajokull in Iceland the following year, and its huge global economic impact, laid that short-sighted suggestion at least temporarily to rest. Currently, two of Alaska's most active volcanoes have woken up and are emitting plumes of steam and ash. Pavlov (means "Paul" or "St. Paul" in Russian) became active on May 13. It is part of the Aleutian arc of volcanoes that bound the Pacific Plate on the north side, and it is the most active one. The largest historical eruption of Pavlov took place in 1911 after 5 years of smaller eruptions. The eruption was from a fissure on the north flank of the volcano, and consisted of lava flows and the ejection of large blocks. 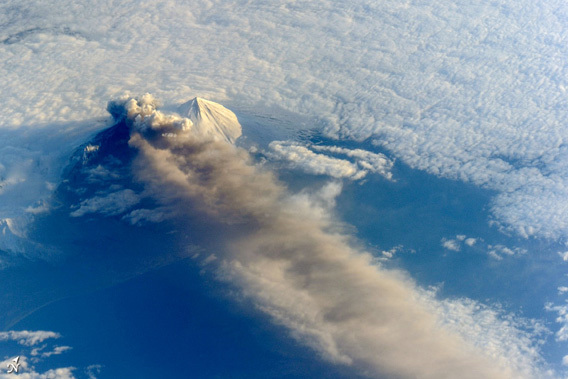 In this eruption, gas and ash have reached 22,000 feet so far, and ash has been seen to extend downwind for hundreds of kilometers by the astronauts. The volcano is 625 miles southwest of Anchorage. There are 40 known eruptions since the late 1700's. Cleveland volcano is persistently active, with at least 19 eruptions since the 1980's. It's current activity consists of single, discrete explosions, of the type often called "Vulcanian" by volcanologists. Some of these explosions have sent ash as high as 35,000 feet. I have written a short article for "Time Views," to appear on Tuesday June 4 in their on-line edition. In this article, I discuss "chain reactions" that can occur during a geologic event. In the case of these volcanos, Cleveland at least, has been reported to have sent ash up into the altitude at which modern jet airliners cross the northern Pacific (I couldn't actually verify this with USGS data, but even if it hasn't actually sent ash that high, either of these volcanoes is capable of doing so). Cleveland, particularly, sits right below such a route. The chaos and chain reaction that can be created by volcanoes like these was dramatically illustrated when the Icelandic volcano Eyjafjallajokull erupted in 2011. Air travel for millions of people was disrupted, airlines and some hotels suffered greatly (but others profited greatly), and global commerce was disrupted. Food and flowers, for example, grown in Africa or New Zealand couldn't be flown into the usual markets in Europe, and so both the growers and potential consumers suffered. In our increasingly interconnected globalized world, we can expect such cascading effects to become increasingly more common. In fact, Sid Perkins in a ScienceNOW article on September 19, 2011 pondered reviewed a paper published in PNAS that asked what would happen if an eruption like the Laki eruption of 1783 happened today. Four such eruptions have occurred in Iceland over the past 1,150 years, so this is not an academic exercise. Laki produced 122 million metric tons of sulfur dioxide gas, about what humans produce in a year now. 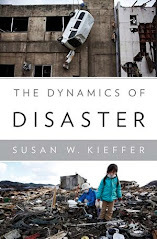 One-fifth of the Icelandic population died, tens of thousands died in Europe, and it is likely that the famines that resulted from the weather and short-term climate changes caused by the eruption contributed to political unrest. In particular, there has been speculation that it contributed to the French Revolution. Anja Schmidt at the University of Leeds in the U.K. and colleagues ran climate simulations of a hypothetical eruption under current conditions. ** In the first three months after such an eruption began, aerosols and dangerous particle concentrations would be concentrated over Iceland and northwestern Europe, but also elevated in southern Europe, as much as 60% above normal levels. In the ensuing year, the air pollution would kill an estimated 142,000 people (over the normal death rate). Such an eruption might shut down European air traffic for six months or more, and have a huge impact on European crop yields. These, in turn, could not be replaced because of the shutdown of air and possibly shipping traffic. And, to return to Bobby Jindal's comment: The U.S. Geological Survey is monitoring the activity of these two volcanoes and, should the intensity of the eruption pick up, will be working with the National Weather Service and the Federal Aviation Administration to find safe routes for those aircraft. ** Schmidt, A., et al., "Excess mortality in Europe following a future Laki-style Icelandic eruption," Proceedings of the National Academy of Sciences, published online before print September 19, 2011, doi:10.1073/pnas.1108569108 PNAS September 19, 2011.